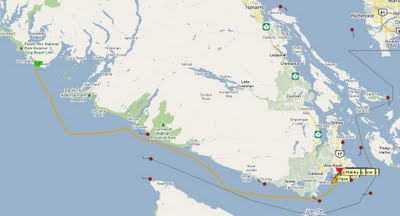 Today we left Uki on a 90nm run to Victoria -- it looks like it will be a nice downhill run through the whale pasture. 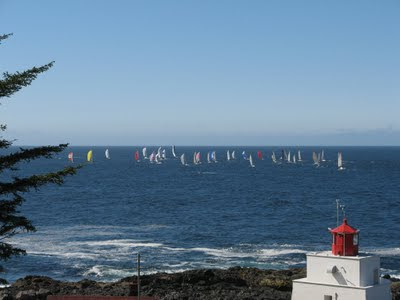 It was really lumpy at the 10:00am start and after setting the kite we headed to Cape Flattery. Expecting a header we gibed back towards the Carmanah Lighthouse. The wind started getting light and we were really headed, nearly forcing an expensive gibe back out. In the end we were able to hold the Code Zero and literally rocketed along the beach until heading back out into the middle for more pressure. The wind started to build and we ended up in front of everyone - rhumb lining for Race Rocks were the winds were predicted to be 30+ knots. While peeling from our A2 to A4 we managed to put a little tear in the A2 which we repaired down below. Later we also put a big tear in our A4 which held until the finish. After mid strait the winds built to 20-25 knots and we had sustained boat speeds of 14-16 knots, peaking at 18.6 during one surfing episode. The farther down the Strait we got the smoother the water. When we got to the Race we were dead even with DragonFly and Makika. We managed to transit the race just at slack, with the door closing hard behind us as the ebb current built. We held the A4 together as we pressed up to the finish, then dropped it as we jib reached to the finish at 7:08pm averaging over 10 knots from Uki to Victoria. We don't have the finish results yet, but we probably corrected to second behind Jonathan McKee's Dark Star and ahead of Carl Buchan's Madronna and Steve Travis's Flash. A nice downhill sleigh ride!